Gather the family and hop to making Easter memories when everyone joins in to decorate Easter Bunny Cookies. Any seasonally shaped cookie will work here – chicks, eggs, carrots, lambs, etc. 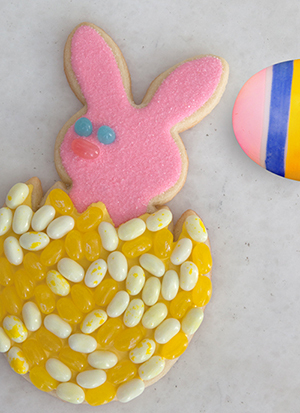 Have fun with our Easter Bunny Cookies. They're the perfect Easter treat to share with your family. There's no doubt your kids will love them! Dani B will show you how surprisingly simple it is to decorate this bunny with Kids Mix Jelly Belly jelly bean flavors that kids like best. Here's the bunny icing template she used. Mix together some royal icing with pink food coloring until desired shade is reached. Transfer to a small squirt bottle with a thick tip. Leaving a ¼-inch border, outline bunny portion of a cookie and draw a jagged edge where the bunny meets the egg. Draw several zigzags across entire surface of outlined area. Use a spatula to spread evenly, and then shake cookie gently to settle icing. If there are any air bubbles, use a toothpick to pop them. Using a sharp paring knife, cut one blue Jelly Belly jelly bean in half crosswise. Place the halves, cut side down, on cookie to resemble eyes. Add a pink one to resemble a nose. While the icing is still wet, transfer cookie to a paper plate and sprinkle bunny generously with sanding sugar. Working over the paper plate, shake off any excess sugar and reserve for remaining cookies. Using a toothpick, remove any remaining grains of sugar along the edge where bunny meets egg. Let dry at least 15 minutes before proceeding. Mix together some royal icing with yellow food coloring until desired shade is reached. Transfer to a small squirt bottle with a thick tip. Leaving a ¼-inch border, outline egg portion. Draw several zigzags across entire surface of outlined area. Use a spatula to spread evenly, and then shake cookie gently to settle icing. If there are any air bubbles, use a toothpick to pop them. Following shape of egg, use tweezers to add Jelly Belly jelly beans closely together to fill, forming a mosaic pattern. You'll want to work fairly quickly, as the icing will begin to dry. Repeat process with remaining cookies. Let cookies dry completely before packaging, about 8 hours.